The Drug Enforcement Agency has been quietly spending millions on off-the-shelf spyware for the past few years. 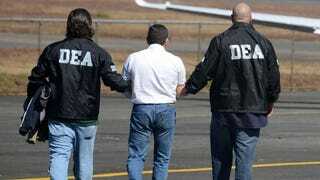 The DEA originally placed an order for the software in August of 2012, according to both public records and sources with knowledge of the deal. In light of recent reports of the agency’s history of dragnet spying, the DEA’s decision to buy a surveillance tool hawked as “untraceable” and meant to evade encryption warrants public discussion. How frequently is this being used? And under what circumstances? We don’t know. But we do know how other countries have used this exact spyware — to track political dissidents. While contracts are between the DEA and a company called Cicom USA, Motherboard discovered that Cicom USA is “simply a reseller” for Hacking Team, the controversial and spectacularly sketchy Italian surveillance company recently blacklisted as an “Enemy of the Internet” by Reporters Without Borders for its habit of selling spyware to corrupt governments so they can spy on journalists and activists.